Ojai Garden Cottage - Classic, peaceful - yet in town - walk everywhere! Classic Ojai stone cottage - light and bright - available by the month - best place in town! Cottage has been remodeled with maple floors and skylights, but retains its authentic, period charm. There is a full kitchen and a pantry. Great front porch! There a bedroom with a queen size bed and bath with tub/shower. Living room has a queen sleeper sofa and small fireplace. There is a flat screen TV with cable TV and DVD player. Also WiFi. Washer-Dryer, and AC (air conditioning). Sit out on the front porch under the large oak tree for your morning coffee. You will feel cozy and right at home! You may visit the property or talk with the owner on the telephone once you have made your deposit. If the property does not meet your requirements, you can initiate a cancellation and the deposit will be refunded. This is the only way to obtain contact information through HomeAway. The cottage is peaceful and private, set off of the street in a quiet neighborhood, yet in town so you can walk to the grocery store, farmer's market, post office, museum, restaurants or festivals or tennis in Libby Park. Use of a great tennis and swim club is available for an additional fee. Great public tennis courts also. Ojai is a 20 minute drive to a wonderful beach and boating opportunities in Ventura harbor. We love Ojai for it's natural beauty, great weather, small town charm, and friendly, community feeling. It's surrounded by the Los Padres National Forest where we love to hike. We swim year round and enjoy the wonderful bike trail. We enjoy the remarkable music and theater in Ojai. We also love to visit the beach in Ventura, which is only 20 minutes away. We drive 45 minutes to Santa Barbara for all it has to offer, and LA is only 1 1/2 hours away. It's the perfect climate and combines old fashioned small town living with art, music and theater. There is a large flat screen TV with cable TV service. Also WiFi. Quiet, wooded location in town - ten minute walk to grocery store, movie theater, post office, Libby Bowl, restaurants and shops. 20 minute drive down the hill to the beach. 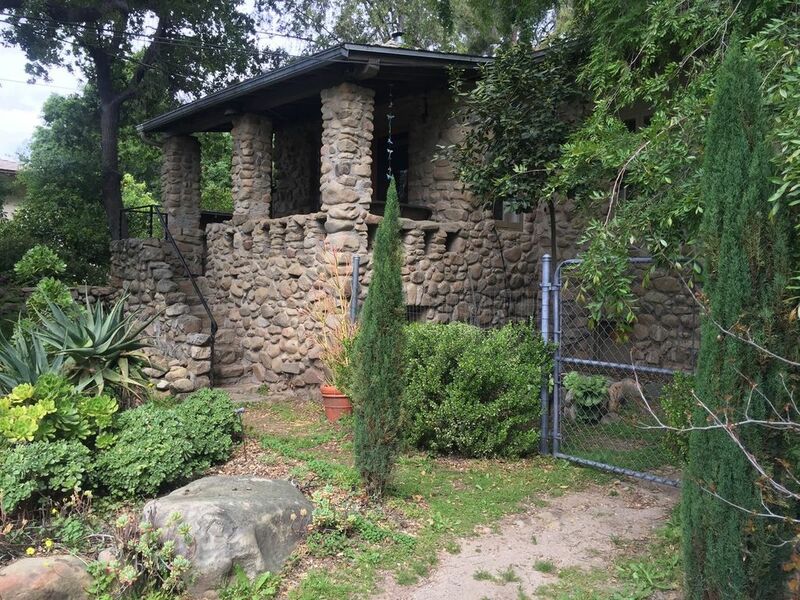 We loved staying in this stone cottage in Ojai. It is a charming place with lots of windows and skylights. It has a lovely front porch where we enjoyed most of our meals under the beautiful oak trees. It is in walking distance of downtown, Sunday farmer's market, and great hikes. We also enjoyed the proximity to Ventura and Santa Barbara. The owner and daughter were very friendly and available to respond to any need. We can easily recommend you consider this as a destination, as we did for a month. nature. Jane is a delightful lady, keen to answer and questions or offer assistance. I'm so glad you enjoyed your stay at our cottage, found it equipped with everything you needed, and had a relaxing and restorative retreat! We hope you will come again soon and enjoy the special light, nature and magic of Ojai. I spent a month here and didn't want to leave. The cottage or the town. Everything clearly pictured and represented. It couldn't have been more lovely. Thanks Jane, hopefully I'll be back. We're so glad you enjoyed your stay at our garden cottage, and in the delightful town of Ojai. We hope to see you back again soon! Went back to Ojai to see friends and enjoy the beautiful valley of my youth. I loved this quaint stone cottage and would definitely stay there again when I come back. I is convenient to downtown, maybe a 4 block walk, and also near trails for hiking. You can walk around to Signal St. to catch a Shelf Road walk or go up Canada to get the Pratt trail. The yard is full of beautiful citrus and cactus. The owner was helpful when I needed it, but otherwise I was left alone to enjoy my solitude. Yes, Ojai is a magic place - We're so glad you discovered it's charms and our beautiful guest house! Ojai can be enjoyed in every season, so we hope you will come again soon. We stayed at Casa Piedra for the months of Feb/March 2012. It is located very near the center of Ojai and convenient to many of the activities that make Ojai an enjoyable place to visit. The house is comfortable, clean and hasexcellent facilities: a full kitchen with small gas stove, an assortment of cooking utensils, and an adjacent pantry with refrigerator and storage space; living room with fireplace, large screen television with full cable, and strong wifi connections; and a full bath and shower. The small bedroom has a comfortable queen-size bed and large closet with shelves and hanging space--a tight fit, but quite manageable. The charming stone house has a small porch overlooking a yard with an rich assortment of cactus plants, an old oak tree, and off-street parking. The neighborhood is quiet and convenient. The host and her daughter live behind the cottage and are very helpful and friendly. Ojai has a great bike path which will take you down to the beach. There is wine and olive oil tasting, a great Sunday farmer's market, and a local movie theater. There are miles or trails for horse back riding and hiking. Tennis and swimming are available at a deluxe club for an additional fee. Rents by the month; No taxes due on monthly rental; Cleaning fee $85; Utility fee $150/month; Security deposit $500 refundable To talk to owner on the phone or make appt. to visit house VRBO/HomeAway requires you to book first. Owner will refund in full if you decide the property does not work for you after site visit.